The following is an article from the April 1985 issue of 16 magazine. 16 Chats With Kidd Video's Steve Alterman! Listen In As "Ash" -- From Your Favorite Saturday Morning Show -- Tells All! Kidd Video -- which can be seen every Saturday morning at 11:00 A.M. on NBC-TV -- is an innovative program which combines live performances with animated interpretations of Top 40 songs and some great talent as well. The four members of Kidd Video are concerned with the musical integrity of their band and they're not into posing -- each was already an aspiring musician before being cast for the show. This month, 16 spotlights the group's keyboardist, Steve Alterman. 16: Hi, Steve. Could you start out by telling us your full name and listing your stats? Steve Alterman: Sure. My name's Steven Mark Alterman, I'm 22 (August 16), and a native of New York City. I've blue-gray eyes, brown hair, stand 5'8" tall and weigh about 132 pounds. 16: Where do you live now? Steve: I've an apartment in Los Angeles, CA, on the West side, not too far from the beach. 16: Is anyone in your family also in show business? Steve: Yes, my mother. She does a lot of community theater in Scarsdale, NY. 16: Did you always want to act? Steve: Yes, my very first ambition was to become a Broadway star. I guess if I hadn't gone into acting I'd probably have become a lawyer though. 16: In Kidd Video, you're part of a rock band. Will you be taking your act on the road too? Steve: Yes, right now it's still in the planning stages, but we'll be releasing an album soon with some of the songs we do on the show like "Come Back To Me" and "Video To Radio." 16: What instruments do you play? Steve: On the show I play the keyboards, but I can also play the flute. 16: Are you self taught? Steve: I took lessons for about five years and then continued just on my own. I wish I'd kept on taking lessons a little longer though. 16: You seem to get along really well with the other band members on the show -- can you describe each one of them? 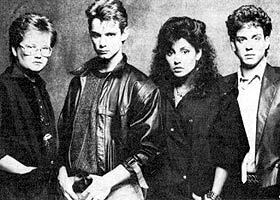 Kidd Video is made up of (l. to r.) Robbie "Whiz" Rist, Bryan "Kidd" Scott, Gabriele "Carla" Rozzi and Steve "Ash" Alterman. Steve: Well, let's see... Robbie Rist (Whiz) is a lot of fun, Bryan Scott (Kidd) is intense and Gabriele Rozzi (Carla) is just beautiful. 16: How would.you describe your own personality? Steve: I think I'm the sensitive type. I change a lot though, sometimes I'm shy and then at other times I'm really outgoing. 16: What qualities do you usually look for in a girl? Steve: Intelligence is very important. I like someone who's not phony either and who can really put it all together. 16: What are some of the things you like to do in your spare time? Steve: Oh, go to a movie, play the piano, sing. Sometimes I'll just go driving along the coast. 16: Who are some of your favorite performers? Steve: Robert Duvall, Sally Field, Huey Lewis and Tina Turner are just a few I like. 16: Do you enjoy cooking? Steve: Yes, I'm a very good cook, too. My specialties are Chinese and Italian foods -- I love Sushi and pizza! 16: One final question, Steve. Do you enjoy getting fan mail from all your fans? Steve: Definitely! And for those who'd like to write, here's an address where they can be sure I'll receive their letters: it's c/o Sound Connection Studio, 11724 Ventura Blvd., Suite A, Studio City, CA 91604. Steve Alterman is in Big Trouble! It's All In the "Rist"!